Home / Reports / The three minute warning…..
On Wednesday we sat with Abu Sadam in the rubble of all that remains of his family’s house, in Hisbet Wadi Joz, East Jerusalem. Early Tuesday morning at about 2am occupying forces arrived with a digger to demolish the house. 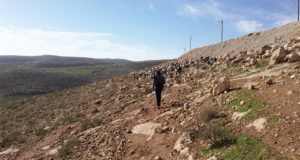 The Israeli authorities have planned a national park and his home is in the way. 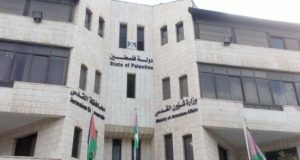 Although the house was on Waqf land (The Jerusalem Islamic Waqf is a trust best known for controlling and managing buildings and land on and around Haram Al-Sharif), because it was built after the occupation in 1967 it is not protected. The family were given three minutes notice to vacate the house and were not allowed to remove their furniture and belongings . Although some of the larger pieces were removed (thrown) from the house by the Israeli military, much has been broken or lost under the rubble. There are sixteen people in the family, most of them children. 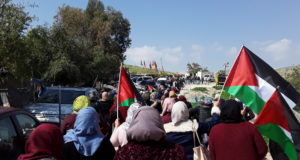 They are now homeless and all they have to protect them from the elements is a tarpaulin sheet .The demolition was aggressive and the occupying forces used physical violence against Abu Sadam, one of the children and internationals who were present at the time. The children are now frightened and traumatised. Today, Abu Sadam’s older sons have been searching East Jerusalem for a house that they can afford to rent. However they have so far been unable to find a landlord willing to take on such a large family at a price they can afford. It is also possible that they will be evicted from the land. As if having your house demolished were not enough, the family also have to pay for the privilege. 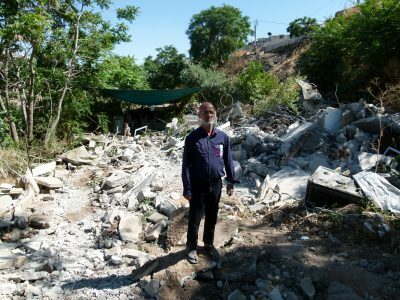 Based on the bills received for other demolitions, Abu Sadam estimates that his bill will be around 100,000 shekels, (about $26,000), an enormous sum and impossible for the family to find. Abu Sadam said that he hadn’t been able to sleep for months, worrying about the demolition that was hanging over the heads of his family, but last night he slept well, knowing that he no longer had anything to lose.